Yesterday, I bought a Crookes radiometer. And proceeded to play with it. 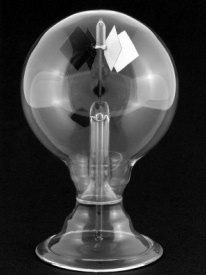 A Crookes radiometer is a simple little device, generally now produced as a novelty item. It allows the quantitative (i.e. wif all numbers in) measurement of the intensity of electromagnetic radiation: heat, light, etc. It’s made of a glass bulb containing a partial vacuum, a low-friction spindle and some lightweight metal vanes, spaced evenly and with one side reflective/white, and the other side dark. The partial vacuum is because some small amount of air is necessary to allow the currents which push the vanes, but lots means there’s too much for the vanes to push against. And, when you put it in sunlight, bounce frikkin’ laser beams off it, point IR at it or even put it near a heat source, those vanes spin (black side trailing/moving away from light). How fast they spin is due to the intensity of the radiation. Also, they spin backwards if you cool the radiometer, which is kinda neat 🙂 And makes me want to put things in freezers. First, the German. Einstein, in fact. It had been proposed that the warmer dark side of the vanes warmed up gas molecules coming into contact with them slightly more than the light side. This then increased the speed at which the molecules bounced off the vanes, in turn exerting a tiny net ‘push’ on the dark side. However, these faster gas molecules would also impede other such beasties from coming into contact with the darker side of the vanes; in theory, therefore, the two forces would cancel each other out. It took Einstein to show that this was not, in fact, the case at the edges of the vanes because of the temperature difference there. BUT. This didn’t quite explain the speeds seen – more was needed. And it was provided by one Osborne Reynolds*, who was a big man in fluid dynamics**. He found that if a porous (i.e. wif all holes in) plate was kept hotter on one side than the other, gas molecules would flow through the holes, from the cooler side to the hotter side***. Kinda like people flowing from a couch onto a dancefloor. Maybe. ANYWAY, while the vanes in a Crookes radiometer aren’t porous, the space around their edges behaves like pores, with gas flowing from the cooler (light) to the warmer (dark) side. This causes a pressure difference****, pushing the vanes forward. Anything else that you may read in booklets/museums/anywhere else is incorrect. It’s NOT light pressure pushing on the vanes; nor is it the dark sides outgassing. So, both of these forces are in play, although apparently, we’re not sure which (if either) has the greater effect. End note: a friend of mine also has one, but on his, each vane has a single, large black dot on the light side. Apparently there is still debate as to which design is better. * However, the research was actually published by one of my favourite Scots of all time: James Clerk Maxwell. Not only is he a pivotal figure in electromagnetism as well as a bunch of other stuff, he also liked to write rather clever (but still silly) poetry. *** Remember, kids – temperature is simply a measurement of how fast particles are moving. **** Ahem. To be more accurate – this happens when the pressure ratio is less than the square root of the absolute temperature ratio. What happens if you direct the laser spots at the white sides? Or two equal-output lasers at both sides concurrently? Or, alternatively, place it directly in sunlight. Givent hat I live in Wellington, this could be tricky.